– You can now export your model documentation as PDF (experimental feature). – Sharing has been improved to allow you to send multiple emails and adding a custom message (real time collaboration coming soon). – The SVG export has been updated to show static elements, attributes multiplicity and comments. – Adding shortcuts to quickly create elements (‘c’ for class, ‘i’ for interface, …). 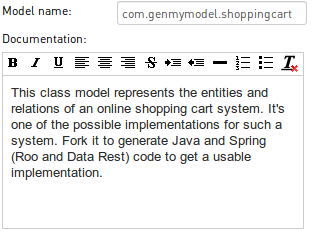 – Adding WYSIWYG editor for comments on model elements. – The attributes multiplicity now correctly works. – Fix a bug that made impossible to redo the creation of an association after several commands. – Special characters are now correctly escaped in SVG files.